Found in East Java, Indonesia, the towering volcano Mount Bromo is the main attraction of the Bromo Tengger Semeru National Park. The otherworldly landscape and stunning scenery have made it one of the most popular tourist attractions on the island of Java. 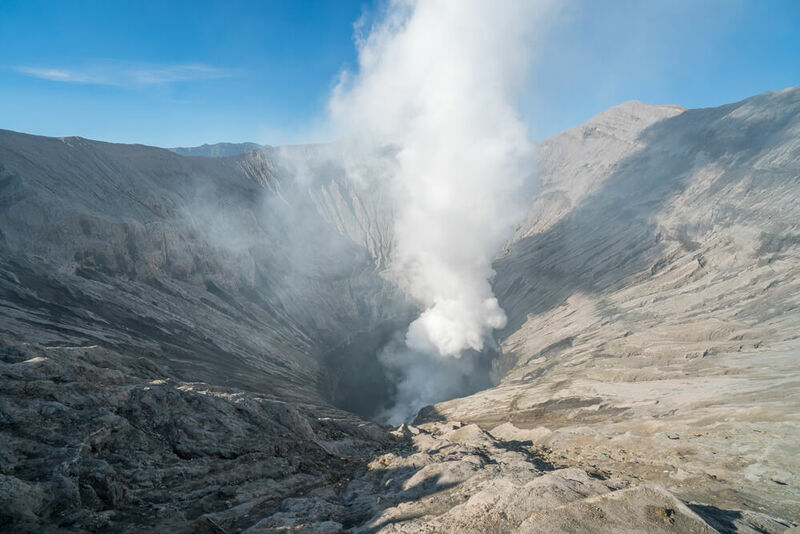 Although Bromo is the highlight, the park is also home to 2 larger volcanoes – Mount Batok (2,470 metres) and Mount Semuru (3,676 metres) – as well as an expansive area of sand/dust known as the Sea of Sand. Just outside the National Park there are some incredible viewpoints of Mount Bromo and its surroundings, which provide some of the most iconic and stunning views in all of Indonesia, especially at sunrise and sunset! 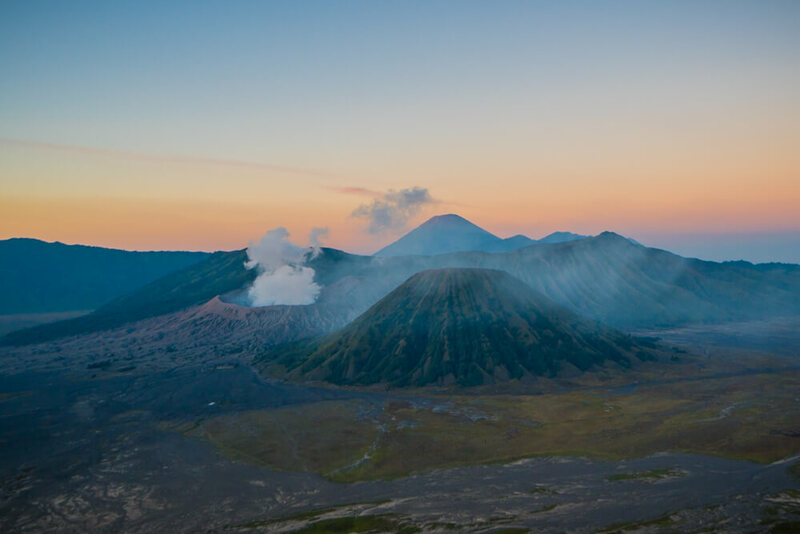 Visiting the Bromo Tengger Semuru National Park is a truly unique experience and so we’d strongly recommend including it on any Indonesia itinerary. This guide covers everything you need to know before you visit – including information on taking a sunrise tour to Mount Bromo, how to visit for free, where to stay and much more! 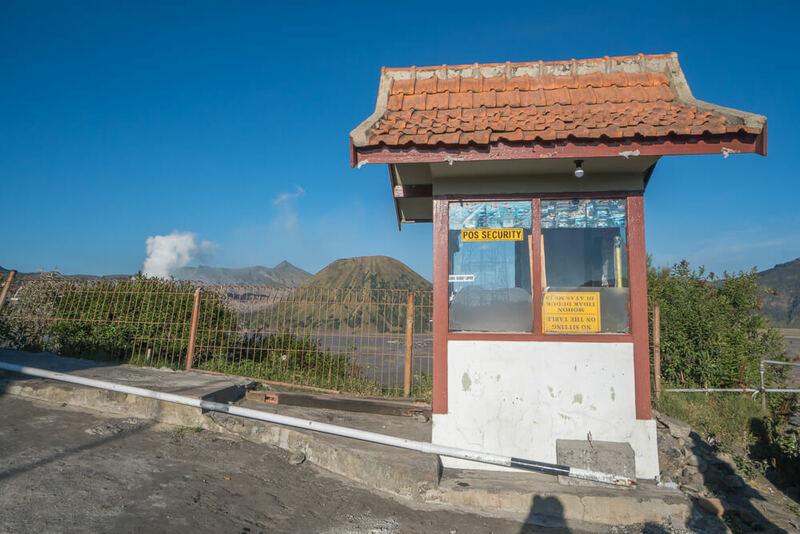 Mount Bromo weekday entrance fee – 217,500 Rupiah. Mount Bromo weekend entrance fee – 317,500 Rupiah. Mount Bromo height – 2,329 metres. Last eruption of Mount Bromo – February 2016. Mount Bromo location – Bromo Tengger Semuru National Park, East Java, Indonesia. Probolinggo and Malang are the closest cities to Mount Bromo. The journey from Probolinggo to Bromo is approximately 45 kilometres and takes around an hour and a half. From Malang you have to go via Probolinggo, so the journey is substantially longer. You can take a tour from either city to Mount Bromo, or if you’re up for a bit more of an adventure you can rent a scooter/bike and drive yourself! It’s relatively easy to get to Probolinggo and Malang by bus or train from a number of places in Java – although if you’re looking to get from Jakarta or Yogyakarta to Mount Bromo you may want to consider flying to save time. Trains and buses can be booked in advance on the Traveloka website. 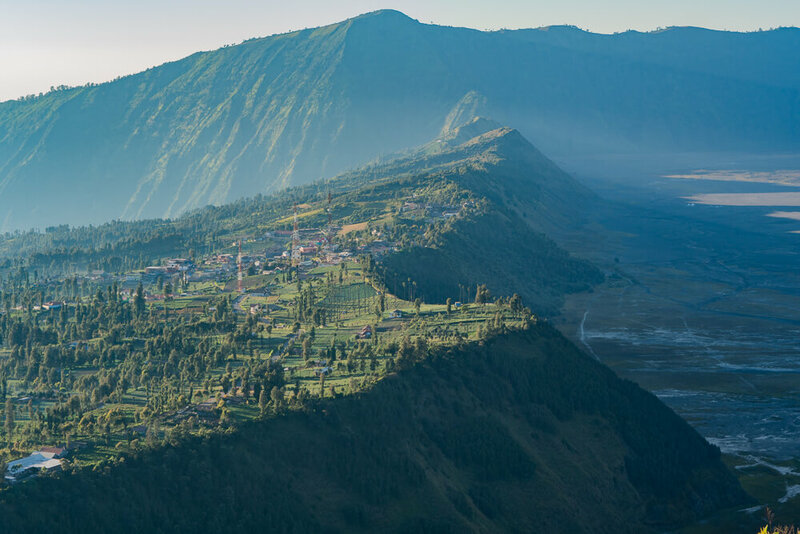 Alternatively, you can make your way to Cemoro Lawang – a small village/settlement located on the edge of the Bromo Tengger Semeru National Park. The easiest way to reach Cemoro Lawang is by bus or taxi from Probolinggo. It costs around 200,000 Rupiah one-way in a taxi or 30,000 Rupiah per person on the bus. The buses only depart once full, unless you pay the amount for 10 people – which is obviously only worth it if you’re in a large group as otherwise a taxi is the cheaper option! One of the main advantages of staying in Cemoro Lawang is the chance to visit Mount Bromo more than once. It’s a truly beautiful place and so if you have the time you won’t regret visiting twice! Staying in Cemoro Lawang also makes it easier to visit Mount Bromo for free. This involves avoiding the entrance fee to Bromo by using an unofficial walking route into the National Park, making it an ideal option for budget travellers wanting to keep costs down. Alternative you can book a combined tour on Get Your Guide to visit both Mount Bromo and Kawah Ijen from Bali. Although doing it this way is more expensive, it’s a good option if you’re pushed for time or don’t want to have to sort everything out yourself. 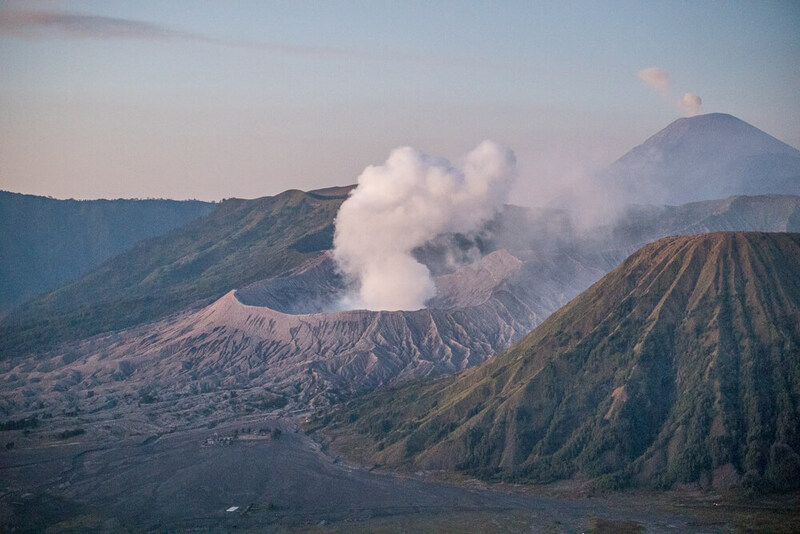 Click here to check out the combined Bromo and Ijen tour on Get Your Guide! The best time to visit Mount Bromo is between April and October as it is the dry season. Walking and hiking at this time of year is a lot easier than in the rainy season! 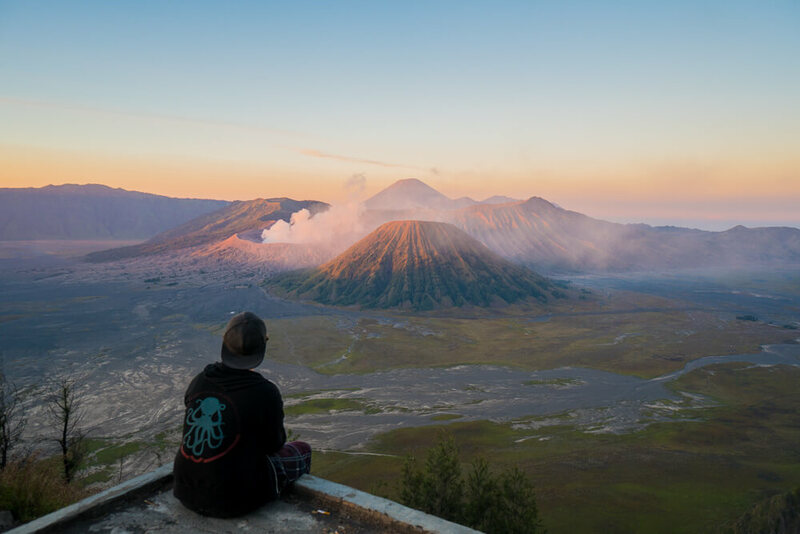 We recommend visiting Mount Bromo at sunrise for truly spectacular views. If you’re treated to a good sunrise, vibrant colours will light up the sky to give you breathtaking views of the incredible landscape. With a bit of luck you may even be able to see the Milky Way in the sky during the dry season. Unsurprisingly, viewpoints of Mount Bromo are very busy at sunrise. If you want to avoid the crowds it’s a good idea to visit later in the day as many of the tours will have been and gone by then. It’s also a good idea to try and visit on a weekday if possible, as weekends tend to be busier with local/Indonesian tourists. On top of that, the National Park entrance fee is actually cheaper on weekdays! Occasionally the Bromo Tengger Semeru National Park shuts down due to increased volcanic activity. Although this is unlikely to affect your trip, it’s worth knowing. If the park is closed at any point you should be able to find out either online or by speaking to locals. You’ve probably already seen lots of pictures online of Mount Bromo and the incredible surrounding landscape. If you’re hoping to have a similar view during your trip then you’re in luck. Just outside the Bromo Tengger Semeru National Park there are some amazing vantage points. Mount Penanjakan and King Kong Hill offer incredible views of the area, and are particularly great viewpoints to watch sunrise at Mount Bromo. If you’re coming on a tour from Probolinggo or Malang then it’s highly likely your first stop will be at Mount Penanjakan for sunrise. Once your driver drops you off you will have to walk uphill for between 10 and 30 minutes depending on the viewpoint you want to reach. Alternatively, if you’re staying in Cemoro Lawang you can make your way there on foot, which should take around 1½-2 hours. Although the hike isn’t too hard, you will have to do some uphill walking to reach the viewpoints. If you do decide to walk to the viewpoint from Cemoro Lawang then make sure to leave yourself enough time to get there before sunrise! Whichever way you choose to get to Mount Penanjakan, you will have the choice between a few different viewpoints of Mount Bromo. Generally speaking, the higher viewpoints are less busy as they take more effort to get to. If you have time and feel capable we recommend getting to the highest one you can as the view is slightly better the further up you go. To reach the King Kong hill viewpoint you will have to climb up large rocks – which can be quite challenging in the dark. We decided against doing this, but if you do continue then you probably won’t find too many other people up there! As the time of sunrise varies throughout the year you will need to plan your trip to ensure you arrive on time. Alternatively, you may prefer to visit the vantage points later in the day as sunrise is the most popular time to visit. 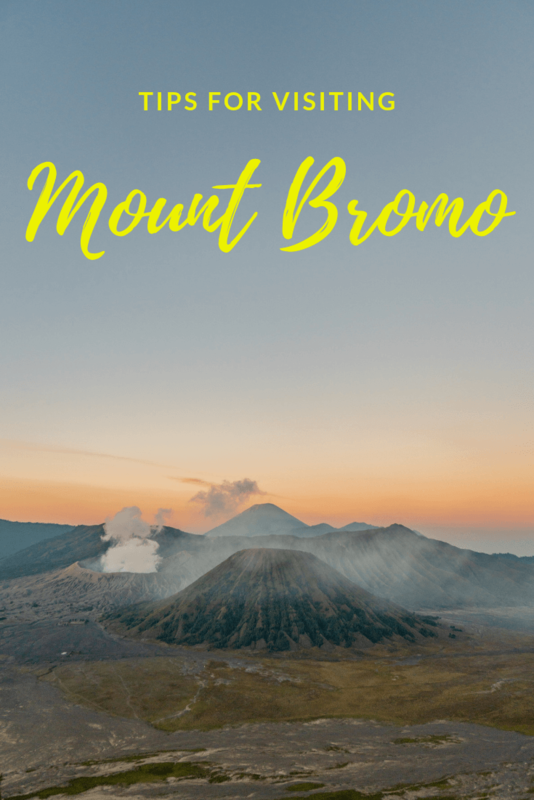 If you do visit the Mount Bromo viewpoints later in the day then they will be a lot less busy as the majority of tours choose to visit at sunrise. As the viewpoints are not inside the National Park you do not have to pay the entrance fee to access them. 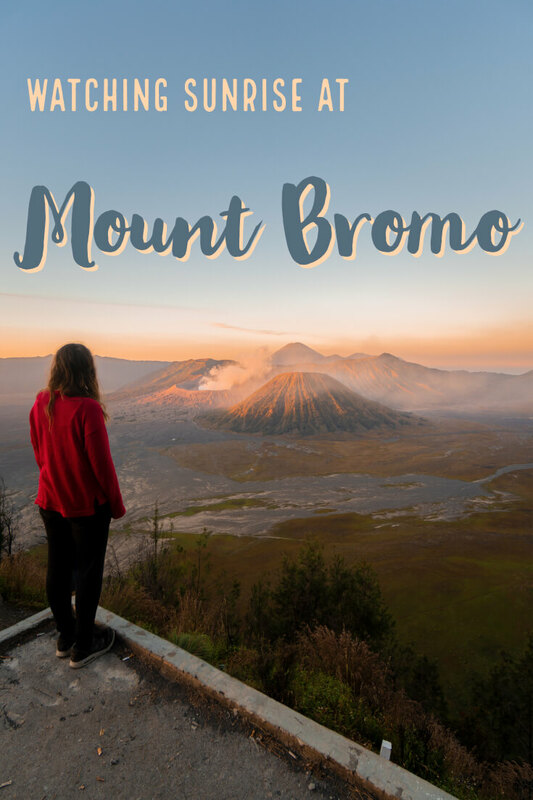 If you’re a budget traveller or just looking to save some cash, then it’s possible to visit Mount Bromo for free by avoiding the entrance fee. Visiting this way involves a lot more walking, so you need to decide if you think it’s worth the effort to save around 300,000-400,000 Rupiah. We personally opted for the free route and it isn’t too strenuous, so it’s definitely worth it if you’re travelling on a budget. Although it’s possible from Probolinggo, it’s a lot easier to visit Mount Bromo for free from Cemoro Lawang as it’s located just outside the National Park. After you’ve enjoyed the sunrise from Mount Penanjakan, the next step is to visit Bromo itself. Make your way back to Cemoro Lawang and find the Cemara Indah Hotel, which has a statue of a man riding a horse at the front. From the front of the hotel you should be able to see the security booth pictured below. By entering the National Park here you able to avoid paying the entrance fee and access Mount Bromo for free. Although there is a security booth, there is rarely (if ever) any security there to prevent people taking this route. Despite this, we didn’t see many other people taking this route when we visited. If security do happen to be there you may have no choice but to pay the entrance fee. There is a trail to the right of the security booth which you need to follow downhill. The path is fairly steep, but it’s manageable if you take your time. At the bottom of the trail you will reach the famous Sea of Sand, which you need to hike across in order to reach Mount Bromo. It’s easy to tell where you need to go as you can see Bromo towering above you in the distance. Crossing the Sea of Sand can be tough as there is no shelter and dust/sand may blow towards you as you walk. In total it takes around 45-60 minutes to reach Mount Bromo if you take the free path. As you approach Mount Bromo the path gets tougher as it begins to lead upwards. By this point you are likely to be surrounded by crowds of other tourists – most of whom will have taken a 4 wheel drive across the Sea of Sand. To reach the crater/summit of Mount Bromo you have to climb a number of very steep stairs. The stairs don’t take too long, and if it’s too tough to do in one go there are a few points at which to take a break and let other people past. It’s a little tough, but it’s definitely worth it once you get to the top! 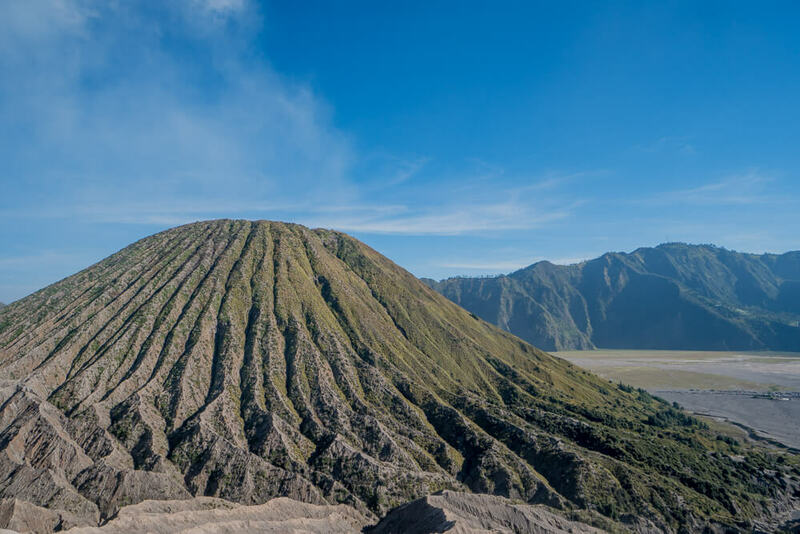 From the top you will have great views of the National Park, including the Sea of Sand and the crater of Mount Bromo. You are able to walk around the rim of the crater, but if you do so it’s important to be careful as it’s a thin path with no barriers. There are unconfirmed reports on TripAdvisor of people falling partially into Mount Bromo’s crater as they tried to walk around it. We saw for ourselves that there isn’t a proper path around it, so we recommend you don’t walk too far around when you’re at the top. Mount Bromo is a very active volcano with smoke often seen rising from the crater. The smoke has a terrible sulphur smell so you may want to consider wearing a face mask. Try to avoid coming into direct contact with the smoke as it may cause your eyes to sting badly. After you’ve finished up at the top, you need to make your way back across the Sea of Sand to Cemoro Lawang. It can be slightly hard to tell which way to go, so we recommend using maps.me (an offline map app) to help. When you first reach the Sea of Sand you should make a marker on maps.me so you know the exact point you need to head back to when you leave Mount Bromo. It should take around another hour until you’re back at the start point of the trail. To visit Mount Bromo for free from Probolinggo you will need to arrange a tour. Some drivers are aware of the alternative entrance and are more than happy to take you there. We stayed at the Colorbox Bromo Backpacker hostel and the owner arranged a tour for us which cost 150,000 Rupiah each to visit Mount Bromo for free. This included visiting Mount Penanjakan at sunrise as well as return transport to Probolinggo. By visiting this way we were able to save the entrance fee as well as the cost of a 4 wheel drive, which would have cost us over 1,000,000 Rupiah for just us 2! If you aren’t worried about saving money then you can book a tour to Mount Bromo from Cemoro Lawang, Probolinggo or Malang. Tours involve less walking as you will be taken across the Sea of Sand in a 4 wheel drive. If you’re looking for more of an adventure and are happy to walk then we recommend the free option above! Tour prices vary depending on where you are coming from. If you are in Cemoro Lawang you can get a jeep/4 wheel drive for around 600,000 Rupiah. These vehicles can fit 5-6 people inside, meaning it can cost as little as 100,000 Rupiah per person (excluding the entrance fee to Bromo Tengger Semeru National Park). This should include a trip to Mount Penanjakan for sunrise as well as the drive across the Sea of Sand to the crater. If you are coming from further away then Mount Bromo tours will cost more. Make sure to confirm exactly what a tour includes before paying, as some will include the entrance fee whereas others won’t. You should also double check that a 4 wheel drive across the Sea of Sand is included to make sure you aren’t being tricked into overpaying and still having to do the long walk! Most tours to Mount Bromo visit at sunrise in order for you to enjoy vivid colours over the magnificent scenery. This obviously means that the further away you are staying, the earlier your tour will depart in order to get there on time. Viewpoints are cold – Mount Penanjakan is 2,770 metres high, so it can get a little chilly at the top – especially if you’re there early in the morning! Bring a warm jumper so you can focus on the view and not have to worry about being cold. There are some people at the viewpoints selling tea and coffee too if you need some extra warmth. Stay for longer – If you have the time, definitely stay in Cemoro Lawang for a few days. Mount Bromo really does have some amazing sunrises so it’s worth getting up early a few times to see it all over again. This way if you do have a bit of bad luck and don’t get a great sunrise the first time round, you’ll hopefully be luckier the next time! Time Zone – Java is actually an hour behind Bali, despite only being a short ferry ride away. If you’re planning to get up early to catch sunrise then make sure you have your device(s) set to the right time zone! Don’t ride the horses – Don’t be tempted to pay for a horse ride across the Sea of Sand to Mount Bromo. The horses are treated badly by their owners, who do not care if tourists are too heavy for their horses and whip them if they are going too slow. Even if you’re feeling tired we strongly urge you not to pay for a horse ride as it encourages the continuation of animal cruelty. If you take a tour/4 wheel drive across the Sea of Sand then you don’t really need to pay for a horse anyway as the car will be parked fairly close to Mount Bromo. Avoid weekends – Avoid visiting during the weekend or on a bank holiday. Not only are these days more crowded with locals visiting, but it actually costs more too! For a more serene and cheaper experience, visit during the weekdays. If you’re looking for budget accommodation near Mount Bromo then the Colorbox Bromo Backpacker Hostel is the place for you! You have the option of rooms with either air con or a fan, and breakfast is included in the price. On top of that, the owner of the hostel is also more than happy to arrange tours to Mount Bromo and Tumpak Sewu. 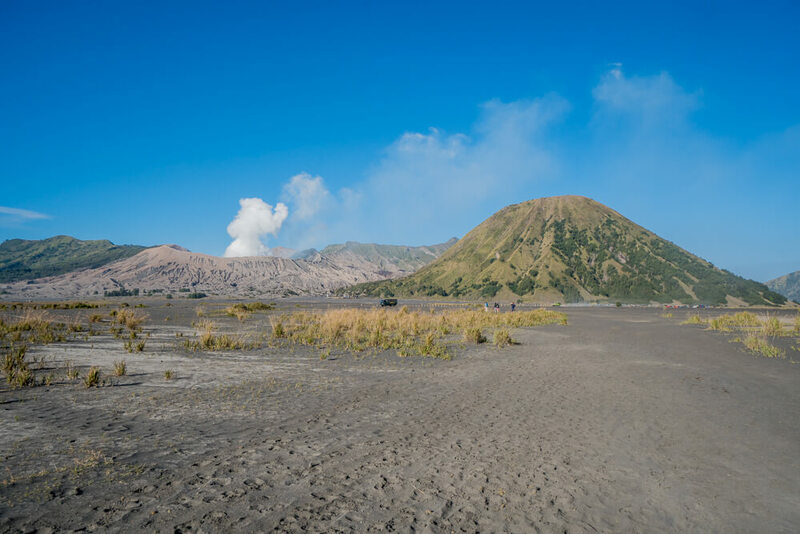 For just 150,000 Rupiah each the owner took us on a tour to Mount Bromo from Probolinggo and showed us the alternative free walking route – which is ideal for budget travellers! Rooms start from around 85,000 Rupiah ($6 USD) per night. Click here to check out the latest prices at the Colorbox Bromo Backpacker Hostel! Clover Homestay is another great budget option in Probolinggo. The property is well located nearby to a supermarket and the staff are friendly and helpful. Rooms with air conditioning are available and breakfast is included in the price. Staff at the Clover Homestay are also happy to help arrange a sunrise tour to Mount Bromo! Rooms start from 166,000 Rupiah ($12 USD) per night. Click here to check out the Clover Homestay for your trip to Mount Bromo! If you’re looking for a more comfortable stay then look no further than the Bromo Park Hotel. The hotel is more modern than the alternatives in the area, and all rooms are fitted with air conditioning for your comfort. There is a restaurant on site and breakfast is also available at the property. In our experience, you won’t find a nicer property in the Probolinggo area! Rooms start from 359,000 Rupiah ($25 USD) per night. Click here to check out the latest prices at the Bromo Park Hotel for your stay in Probolinggo! If you’re looking to stay in Cemoro Lawang then you will need to contact places directly. There are a number of small hostels and guesthouses in the area, but if you’re looking for some home comforts then you’re better off staying in one of the cities nearby. Like this guide to watching sunrise at Mount Bromo? Pin it! Ahhhh. I love sunsets and your photos make me want to pack up and visit Mt Bromo. Thanks for this guide Sam and Natalia. I’m gonna save this for later. Thank you! Java has some really beautiful places to visit!